Leave Lincoln Street and take the first left onto Gates Avenue. Stop at the corner of Gates and Lincoln. 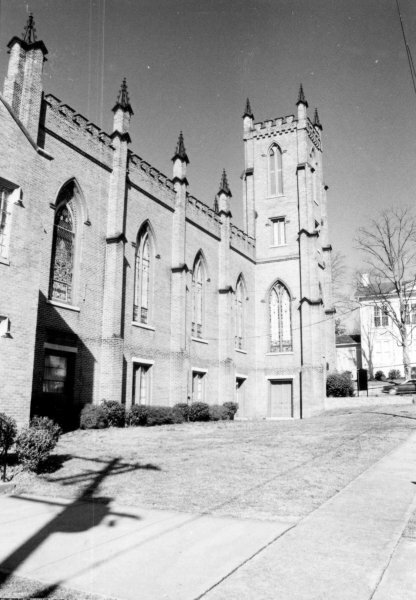 On your right is the First Presbyterian Church at 312 Lincoln Street. 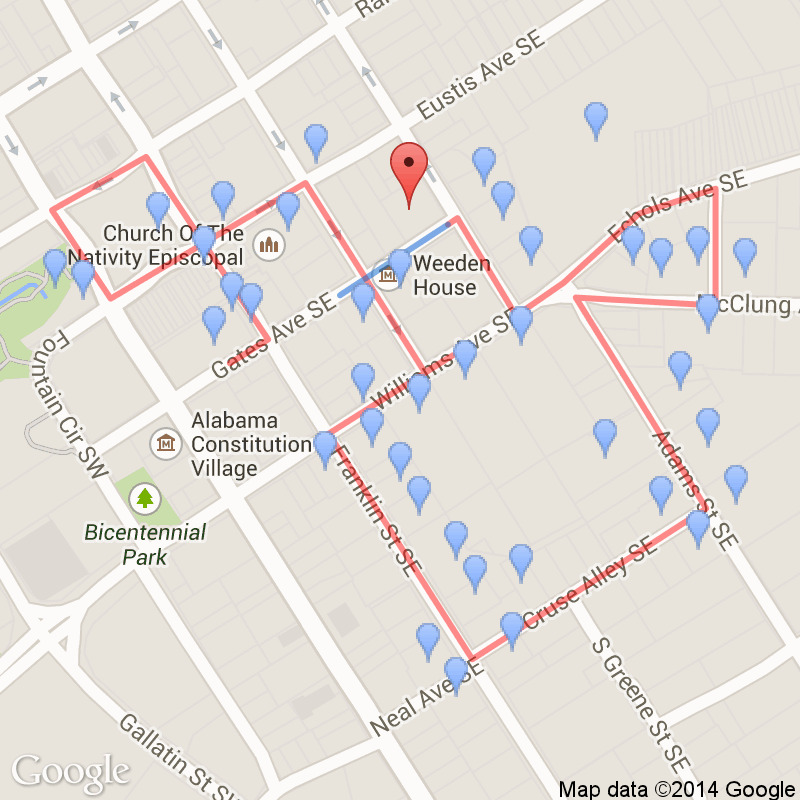 Organized in 1818 before statehood, this is Huntsville's oldest Presbyterian Church. 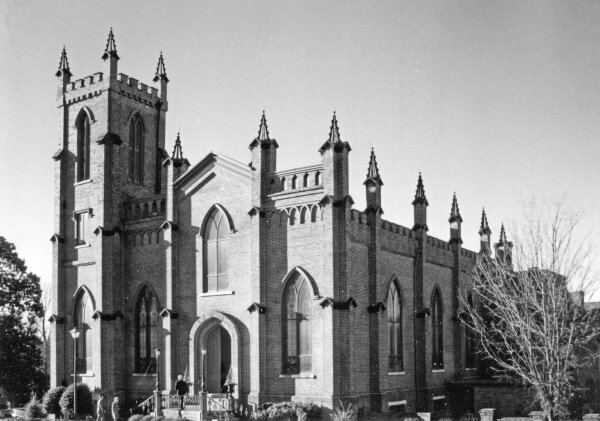 This Gothic Revival building was dedicated in May of 1860. Originally, the congregation wanted to have a spire on top of the tower. Now the architect, well, he didn't think that was such a good idea, but the members just knew that an 85 foot spire would be taller than the Episcopal and the Methodist towers that you can see there in the distance. The architect, well he still didn't think that it was a good idea, but, after all, the congregation was paying the bills. It was a fine tower that included a bell and a spire reaching above and beyond to the heavens. The bell soon fell off, but it and all the other bells in town were taken away at the start of the Civil War, melted down and cast into cannon. These were called the Huntsville Bell Battery. The cannons have never been fired when the Federals captured town in a surprise action in 1862. This church survived the war, although it housed soldiers and their horses during the winter. The pews were simply shoved together to form stalls and fires were built for cooking and heating. In 1878, during a violent storm, while the congregation was seated for Sunday services, you might have guessed it, the spire was blown off and destroyed. The members choose not to rebuild it again. Organized June 15, 1818 by the Rev. Gideon Blackburn, D. D.
One of the state's oldest Presbyterian churches. This site was selected for the first church building, dedicated on Oct. 13, 1822. 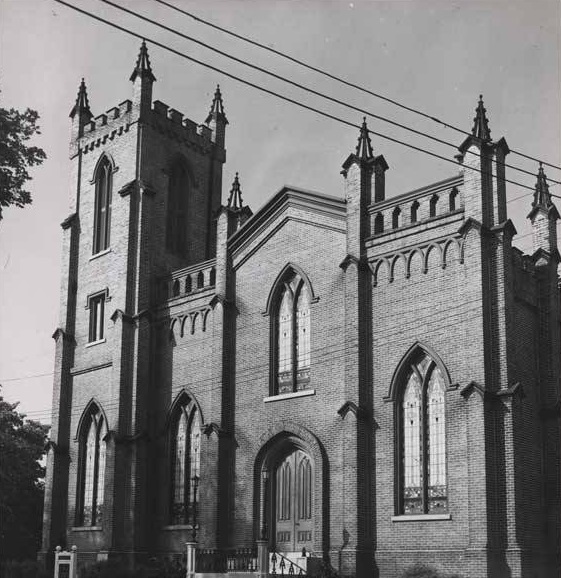 The second, and present, sanctuary was dedicated on May 18, 1860. Names of all ministers who have served this church are recorded on plaques in the sanctuary. This marker erected on 150th anniversary of organization. "First Presbyterian Church. 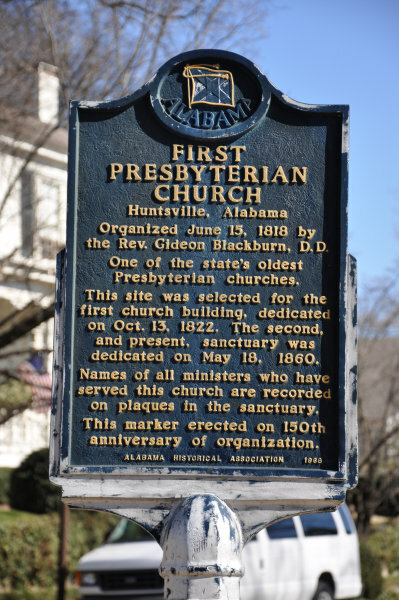 First Presbyterian Church, located on Gates Avenue in Huntsville, was organized June 15, 1818. 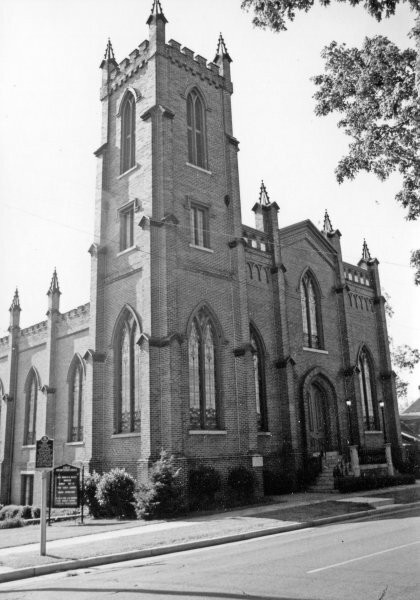 It was one of Alabama's first Presbyterian churches. The current building, dedicated May 17, 1860, replaced the small frame building, which had been dedicated in 1822. 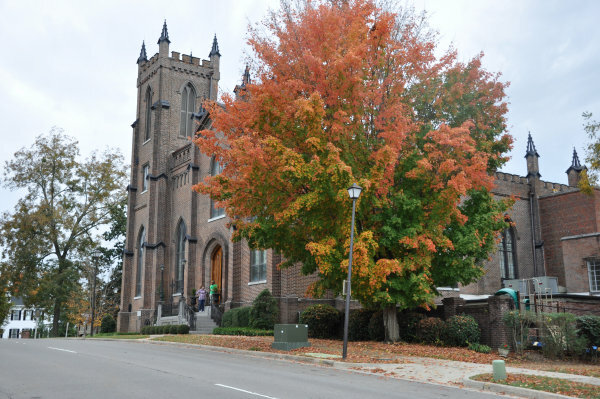 This Gothic Revival church was the work of Nashville architect Adolphus Heiman and is still in use today. " Architect's drawing of present church. Dedicated May 17, 1860. 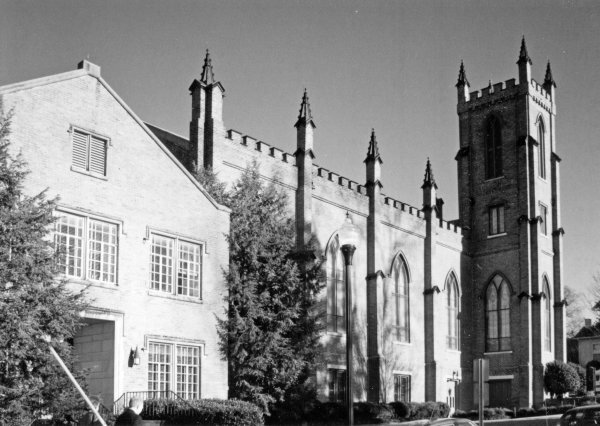 SW Education Building for First Presbyterian Church, c. 1958, Turner & Northington Arch. First Presbyterian Church Read Wings. 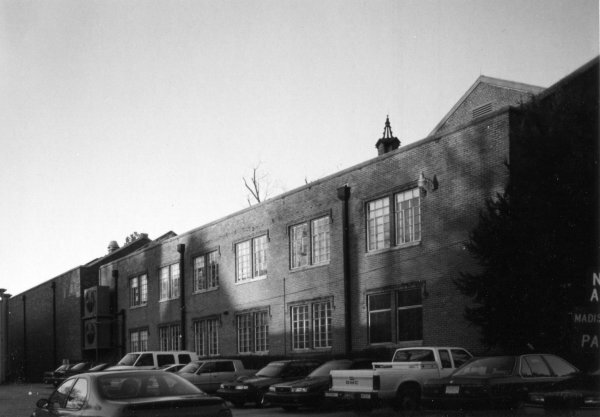 C. 1955 Addition (SW wing) - Turner & Northington, Arch. 1967 Addition NW wing, Dickson, Jones & Davis, Arch. (H. Jones).